Ananka's Diary: Bring On The Flies! Who knew killing insects could be so darn entertaining? 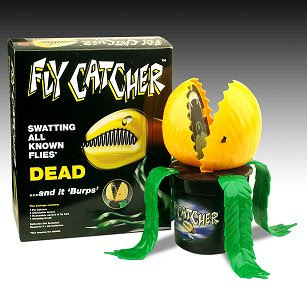 Shaped like a Venus fly trap, the Fly Catcher (available in the UK) is an essential gadget for anyone who lives next to a garbage dump or pig farm. Hidden inside its mouth is a non-toxic bait. When a fly lands for a nibble, the Fly Catcher's jaws snap shut, killing the pest in an instant. Then comes the best part--the device issues a loud burp, indicating it's ready for another meal. Truly technology at its best.